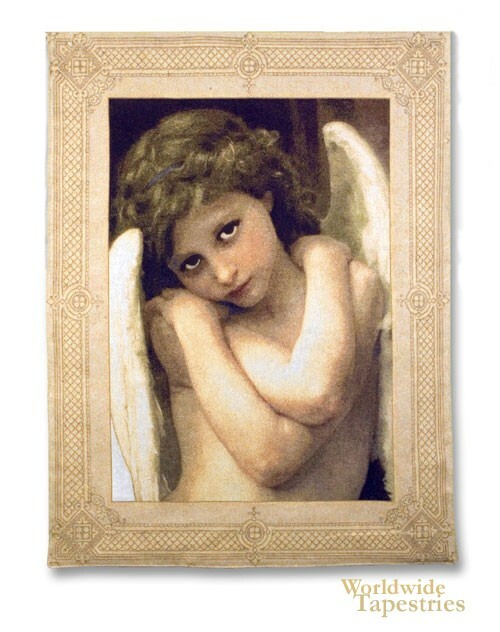 This tapestry is a detail from "Cupidon" the work of French academic artist William Bouguereau from 1875. From its companion piece "Cupidon", this piece focuses on Cupid's face. Though Cupid is thought to be traditionally male, this rendition of cupid is often seen as female. What Bougeureau brings to art of the Academic style, which are influenced by neoclassicism and romanticism is his sense of sensuality. This sensuality infuses his works with an innocence and evocativeness that is unmistakable, and is a perfect complement to his subject in this piece, Cupid or Eros. The beautiful use of light and shade as well as its beautiful design, makes this piece one of his most well known and loved pieces. This iconic image is on par with the fame of Raphael's cherubs. This piece, whether in its entirety or in the detail here, bears the hallmarks of the works of this artist Bouguereau. This tapestry is backed with a lining and has a tunnel for easy hanging.